On March 3, civil rights leader John Lewis took a bus across the state of Alabama. It was, of course, not the first time John Lewis had made this trip: he had been on a similar bus trip in the 1960s as a freedom rider to end desegregation in a country where he and others faced ignorance, hate, and violence. There are fortunately many differences between John Lewis’s 1960s trip and the one on March 3rd. One small difference is that on March 3rd I rode with him. For three days, March 3rd to 5th, I left behind the hectic tumult of Washington, DC and joined the Faith and Politics Institute on a three-day pilgrimage through Alabama. We visited some of the most iconic sites in the civil rights movement that transformed the state, the country, and the world. Pilgrimage is a form of spiritual discipline through which a person intentionally opens up to transformative experiences. As Adele Calhoun says, “[T]he intention to leave something behind in order to seek God is at the heart of pilgrimage.” My intention for this pilgrimage through Alabama was to learn more about the black women of the civil rights movement; my great-great grandmother was a black woman who fled the South shortly after the civil war, and I wanted to learn more about struggles that people like her had to overcome in the Deep South. This pilgrimage allowed me to learn not only about the challenges she would have faced but also the courageous women that helped lead the civil rights movement. It was a transformative experience for myself that I will take forward with me into my relationships and my professional career. On the first day of the trip, we visited the 16th Street Baptist Church. This church was the site of a Ku Klux Klan bombing in 1963 that killed four young girls as they came out of Sunday school. This tragic event eventually led to the passing of the 1964 civil rights act. This experience taught me that no contemporary discussion of terrorism can ignore the troubled history of African Americans who have repeatedly been the victims of state sponsored terrorism within our own borders. This experience also led me to appreciate the powerful model of the Faith and Politics Institute that brings together members of Congress from across the aisle to share in these historical experiences. Sixteen members of Congress from across the country joined this pilgrimage to Alabama, the seventeenth time that the Faith and Politics Institute has organized the trip. In doing so, they are helping to bridge the partisan gap in the US government by developing bipartisan leadership built on a common understand of justice. The second day was even more profound. The day began by visiting the Edmund Pettus Bridge in Selma where civil rights leaders attempted to march three times to Montgomery to demand voter rights. The third time, escorted by federal troops, they were successful and ultimately were able to pass the Voting Rights Act of 1965. Joining us were many of the very people who had marched, and in sharing their experiences they created a sacred moment in commemoration of the sacrifices of so many people along the way. As Juanita Abernathy said, “We didn’t have no sneakers on. We had loafers, and we marched with blisters on our feet.” Due to the sacrifices of her and others, African Americans were able to secure the respect and dignity they deserve and were denied for so many years. The day ended by witnessing the reconciliation that has occurred between John Lewis and Peggy Wallace Kennedy, daughter of George Wallace, Alabama’s governor throughout the 1960s . The third and final day of the pilgrimage began with a Sunday church service at First Baptist Church where pastor Morris preached a message of trust in God for control over the conflicts of today. He shared that the lessons we learn through the conflicts of today have their purpose in the tasks we are called to do tomorrow. We also visited the historically black Alabama State University that is busy training the next generation of leaders in the continuous struggle for the rights, respect, and dignity of African American people. Our final stop was at the Rosa Parks museum where her memory and that of other women like her has been preserved in this institution. We left with no doubts in our mind that black women truly were the silent backbone of the civil rights movement. As we returned back to Washington, DC, I reflected on how I had changed over the weekend. I learned about the struggles of African American women in our nations history, and I met one woman in particular, Congresswoman Sewell, who I would gladly support for President if she would consider running in the next national election. I gained a deeper understanding of how to engage with our current political environment in a way that helps to lesson the polarized nature of our government. In the words of John Lewis, there is still much work to be done in order to “redeem the soul of our nation.” Finally, it was impossible to not be transformed through the powerful acts of forgiveness from those who have experienced deep injustices. In our country today, it is necessary now more than ever to take with us some of the forgiveness and grace that has accompanied the long, slow march for justice by African Americans. In an op-ed for the Washington Post, Mr. Klain continues to explain this idea that he credits to Obama during his second-term. He argues that the political left in the US should reclaim the idea of American Exceptionalism, but that the focus should not be on the military might of the US. Rather, it should be “on the extraordinary acts that Americans perform to help others in need….” This approach is evidenced Hillary Clinton’s campaign phrase, “America is great because America is good.” Humanitarian relief and international aid should take center stage. However, there are a number challenges that go along with this progressive approach to American Exceptionalism. Thoughtful reflection leaves little doubt that the US has a long track-record of supporting dictators and regimes abroad for reasons of pure self interest. Humanitarian aid can often result in a bandaid for systemic problems that does more to make the “helper” feel good and leaves the recipient disempowered. How does the US overcome its legacy of imperialism in many parts of the world, where “help” from the US has made the lives of millions of people worse off? Yet, the rise of nationalism in the US and abroad has recently swelled to frightening proportions. The Doomsday Clock, which measures how close the world is to nuclear catastrophe, is closer to midnight than any other time besides 1953 when the US and Russia had both tested hydrogen bombs. Additionally, the Trump administration is requesting a 10% increase in military spending for the US government, including nuclear modernization. In the US, it is clear that there needs to be an alternative vision of the future, not just for the country but the world. 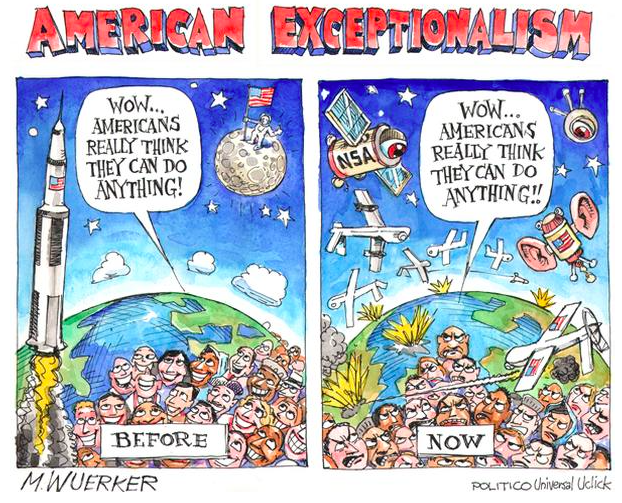 Is a progressive American Exceptionalism a part of such a vision? And if so, how? Developing America is testing the boundaries of the status quo, and calling into question the way we view our identities as American and Global citizens. This is its blog.